A Career in Middle Market Investment Banking. The Origins of a Deal Junkie. The Deal Junkie Arrives (Almost). Disclaimers, Apologies, and Modest Lies. CHAPTER 1 The Middle Market Is Different! CHAPTER 2 Drivers of Middle Market Activity and the Sellers. CHAPTER 3 Finding—and Understanding—Buyers in the Middle Market. CHAPTER 4 Preparing a Middle Market Business for Sale and Running the Business while Selling It. CHAPTER 5 Rewarding and Retaining Key Staff in Connection with a Business Sale: Blackmail or Justice? CHAPTER 6 Crystal Balls and Timing the Sale of a Middle Market Business. CHAPTER 7 The Confidential Information Memorandum. CHAPTER 8 Confidentiality While Doing the Deal. CHAPTER 9 Middle Market Investment Bankers and Intermediaries. CHAPTER 10 The External M&A Team, and Using the Team Correctly. 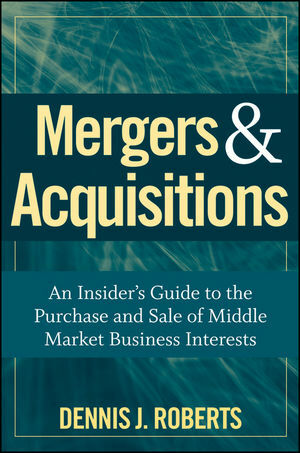 CHAPTER 11 Anyone Can Do M&A—Right? CHAPTER 12 Two Types of Auctions: The Informal Auction and the Controlled Auction. CHAPTER 13 Financial Services Agreements, Estimating Professional Fees, and the Importance of Integrity around Large Sums of Money. CHAPTER 14 Investment Banking Representation on the Buy Side. CHAPTER 15 The Letter of Intent: The Most Critical Document? CHAPTER 16 Some Thoughts on the Psychology of M&A Negotiations. CHAPTER 17 Initial Meetings with Buyers, Pricing the Company, and Pacing the Negotiations. CHAPTER 18 Consideration and Deal Structure. CHAPTER 20 The Proof Phase, or the Final Days. CHAPTER 21 After the Nuptials: Postmerger and Acquisition Failures. CHAPTER 22 Does a Sales-Side Client Need an Appraisal before Going to Market? CHAPTER 23 The Rules of Five and Ten and the Super Rule of Five in M&A Valuation. CHAPTER 24 An Introduction to the Basic Art and Science of Valuation (Sales-Side versus Buy-Side) as Applied to M&A Transactions, and Flavors of EBITDA Explained. CHAPTER 25 A Brief Discussion of Multiples and Multiple Realities. CHAPTER 26 Qualitative Values Inherent in the Target Company. CHAPTER 27 M&A Conventions and Establishing Balance Sheet Targets. CHAPTER 28 Special M&A and M&A Valuation Topics. CHAPTER 29 Common M&A Taxation Issues. CHAPTER 30 The Business of Middle Market Investment Banking. CHAPTER 31 A Postscript: The Capital Markets. CHAPTER 32 Another Postscript: The Unbundled Approach to Formal Valuation.